Acapela Group » Voice first: Acapela Group & SoundHound partnership pave the way for smart voice-enabled AI. Leading independent conversational AI platform adds 100 voices across 32 languages. SoundHound Inc.®, the leading innovator in voice-enabled AI and conversational intelligence technologies, today expanded the multi-language text-to-speech (TTS) offerings for its Houndify™ voice AI platform through a partnership with Acapela Group, the leading provider of voice and speech solutions. 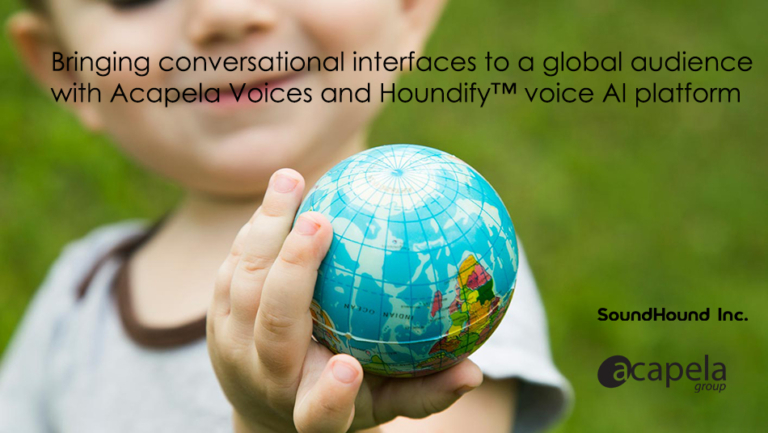 Starting today, Houndify will now provide access to more than 100 different voices across 32 languages, making it one of the most comprehensive TTS platforms in the world. Bring voice interface to your products with unique AI platform and pleasant personalized voices! The partnership brings together the capabilities of Acapela voices and Houndify’s voice AI technology providing companies, developers and brands that are seeking to bring voice assistants and voice interfaces to their products and services, the choice of selecting unique sounding voices that are ‘off-the-shelf’ as well as the option to develop customized, branded voices that perfectly fit to the context and the person of the brand or company. Acapela voices perfectly works with the full suite of Houndify’s voice AI technology, including Speech-to-Meaning™ and Deep-Meaning-Understanding™, which delivers unprecedented speed and accuracy in voice recognition and responses, and understands context, such as the user’s location or previous queries, to support natural interactions. Developers interested in exploring the Houndify platform can visit Houndify.com to learn more and register. The Hound voice search and assistant app is available as a free iOS or Android app, and can be downloaded via SoundHound.com/Hound. Acapela Group, leading player in voice solutions for more than 30 years, is constantly creating new voices to better interact with users, thanks to voices that adapt to the context. Voices that convey meaning, intent and emotions. Acapela Text-to-speech solutions give the say to tiny toys, robots, autonomous vehicles, smartphones, IoT and much more. Acapela creates personalized voices that read, inform, explain, present, guide, educate, tell stories, help to communicate, alarm, notify, entertain. From standard high-quality voices to domain-based applications and custom voices, Acapela’s skills cover the full chain of voice needs in 34 languages. Our latest innovations in deep learning and AI opens up new exciting possibilities for voice creation.